Coming up David Morgan of The Morgan Report joins me to discuss the year ahead for silver. He also gives some great advice on how to make and keep profits when investing in precious metals and talks about a tipping point he sees ahead in the silver market. 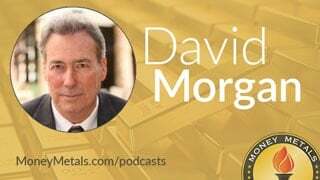 Don’t miss a fantastic interview with the silver guru himself, David Morgan, coming up after this week’s market update. Well, gold and silver markets continue to press ahead. As the Dow Jones Industrials put in 10 days in a row of new record highs, the gold market rallied itself to a fresh new high for the year. On Thursday, gold prices closed just above the $1,250 resistance level. As of this Friday recording the yellow metal is advancing again and currently trades at $1,255 an ounce and now registers a 1.5% gain on the week. Turning to the white metals, silver also broke out to new 2017 highs. Spot silver checks in at $18.36 an ounce, good for a weekly gain of 1.8%. Platinum is up 2.1% this week to trade at $1,026, while palladium – which had cooled off a bit through Thursday’s close is now also in positive territory thanks to this morning’s advance and comes in at $782 an ounce, good for a 0.4% gain since last Friday’s close. The bottom line on markets is that metals have momentum. And, for the time being, so do stocks. The difference is that stocks are quite pricey and overextended technically, while precious metals markets remain relatively depressed -- even despite the recent upward move. Nobody in the mainstream financial media is talking about gold and silver, and few American investors are rushing into them. However, a huge new source of investment demand is now emerging in the Muslim world. The so-called Shariah Standard on Gold is a set of rules put into place late last year that enables gold to be held as an investment while remaining compliant with religious law. The upshot is that several hundred tons of new gold demand is projected to manifest in the months ahead. Here in the United States, safe haven demand for hard money has been scant so far this year. It could accelerate if inflation fears ramp up, geopolitical tensions flare up, or stock market jitters return. People who are new to precious metals investing often ask us what they can do with their gold and silver bullion once they’ve obtained it. One perfectly sufficient answer is simply to hold onto it until you’re ready to sell. In other words, just treat gold and silver coins like stocks, bonds, or other passive investments. Their value will tend to go up over time. And when you’re ready to take profits on your bullion products, you can sell them back to Money Metals Exchange or another precious metals dealer. However, you can in fact do more with your bullion than stash it away with the aim of selling it at a higher price at some point in the future. You can also use it for gifting, bartering, trading, and displaying for conversation. Barter and trade doesn’t just refer to picking up stuff at a flea market in exchange for silver dimes. It is also possible to draw up contracts for loans or big ticket items such as cars, boats, or homes using precious metals. Gold clause contracts, as they are known, define gold as the means of payment. They allow both parties to do an exchange and avoid transacting in dollars. Gold clause contracts can be especially useful in long-term agreements such as loans and leases. If you’re going to be the recipient of a long-term payment stream, you can avoid the risks of currency debasement by insisting on gold, or silver for that matter. And if you’re going to be the one making payments, offering to pay in gold can give you leverage to negotiate for better terms. A gold clause contract is perfectly legal. That said there are many nuances that go into drafting it properly. Full enforcement of the contract to prevent dollars from being involuntarily substituted for gold will depend on your state’s laws. Michael Boldin (Tenth Amendment Center): The gold clause contract. Per Title 31 of the U.S. Code, a gold clause is a provision that gives parties to a contract the option to require payment in gold rather than Federal Reserve Notes. Gold clauses are particularly useful when designing long-term contract as protection against the ongoing devaluation of volatile fiat currency. If more consenting individuals decide among themselves to require payment in gold, it would be hugely beneficial in broadening the use and acceptance of sound money. For these contracts to truly gain a foothold, they must be fully enforceable in state courts, so states should pass strong protections for requiring performance of parties to gold clause contracts. There’s much work that needs to be done to enable gold and silver to become freely competing currencies to the U.S. dollar. Legal and tax barriers to free competition exist at both the state and federal level. But there are positive developments on several fronts right now. For example, Arizona and Idaho are actively considering legislation which removes precious metals from state income taxes. And Alabama and Tennessee are considering whether to join the ranks of over 25 states that do not assess a sales tax on the purchase of gold and silver. Fortunately for investors who simply want to buy, hold, and eventually profit from physical metal, doing so is already legal and easy. Well now for more on the mindset one top analyst believes you should have when it comes to investing in precious metals, as well as some key price levels he’s watching on the charts, let’s get right to this week’s exclusive interview with the silver guru himself. Mike Gleason: It is my privilege now to welcome in our good friend David Morgan of The Morgan Report. David, thanks so much for joining us. It's great to have you on, as always. How are you doing so far here in 2017? David Morgan: I'm doing pretty good, Mike. It's great to be on your show. Thank you very much. Mike Gleason: Well, as we begin here, David, we're off to another solid start to the year in the precious metals markets. Things look quite similar today to where they did a year ago. We also saw some early momentum in 2016. So, what have been the key drivers, in your view, thus far in the metals markets, particularly the white metals, silver, platinum, palladium, which have all outperformed gold to this point. What's behind the advance? David Morgan: A couple of things. It's a lot like last year, I think. First of all, there's always some contingent of people that are looking for a safe haven or a hedge, and of course that ebbs and flows with market conditions and perception. However, long term investors realize that the financial situation on a global basis, the debt structure, is unsolvable. So, I think there's that and there's always people that are adding to that. There's people that invest too much or expect the market ... the gold market or the silver market to move at a certain place, and it doesn't. So again, it ebbs and flows. As far as the white metals are concerned, it's pretty interesting. Number one is that platinum has been under the price of gold for months now, which is highly unusual. I mean with my 40 years’ experience in the metal markets, when platinum reaches a discount to gold, usually it's a lead pipe cinch trade. You just basically arb(itrage) it. You go long platinum, short gold and within usually a few months you are in the profit zone. Not true this time. Part of it has to do with the Volkswagen no-no with the T.D.I. with their diesel engine, and the platinum and palladium's are used in the catalytic converters for gas and diesel. And that's part of it. The other part of it is seasonality. I used to trade platinum and palladium quite a bit and there is a seasonality in the first of the year for both white metals. In fact it's almost a sure thing, of course there's no such thing as a sure thing. So that's part of it as well. There's a seasonality. And if you look at the fundamentals ... I mean platinum is under the cost of production, most of it comes from South Africa. Their mines are a mess. Their workforce is a mess. They have a lot of problems. And so that puts some upward pressure on the price of platinum, at some point in time. But it really hasn't become real robust. I mean obviously as you said it's outperforming gold, but not what I consider in a significant way. So, Mike, I latch to your thought. Look, we're going to see a seasonality of gold and silver, and I thought it would go a month or two. And that's where I started the report in January when I put it out. And I'm a good believer that the market knows more than anyone, regardless of the reasons, regardless of commitment of traders, anything. So, if you listen to the market it will help you a great deal as far as how long the trade will take place et cetera. What I did was I let the market tell me where it was going last year and we got to the point where gold and silver were doing really well in the summer, which is unusual, it's different, than their normal seasonality. And I started to look at the commitment of trades closer and closer and closer, and I picked a point where I was highly uncomfortable. The sentiment was very, very high. And I chose that as a point to off the trade. So, what I do is I keep 75% invested and trade with 25% at the maximum and I like to book profits. And in this new next little market that we're in, it really in my opinion, strong one, it behooves you to be able to trade, because the ebbs and flows are going to be rather dramatic. So, if you can trade with part of your portfolio you can increase your gains. So, what I have said all that to say this Mike, and thanks for listening so well. I am just going to do the exact same thing again this year and hopefully I'll get it right again. Which means, the market is tenuous, the gold commitment traders looks more favorable than the silver one. There's a lot of my friends saying silver's going to go in the short squeeze eminently. I don't see that, but it doesn't mean they're wrong and I'm right, it just means I don't see it, and they may see something I don't. But I'm just going to let the market tell me. I think we've got more upside than both the metals. But I do not think we're going to go all the way into the summer, like we did last year. I think we're probably going to go, I'm guessing now, another month or so. And of course I will update premium members on the website. That's what it's all about, because I do it real time and draw the graph and explain what's going on, and also how the market reacts, in other words, if we get to this point here, I'll draw a line I get the number, then the market is telling us the game is over and you should take your profits. I got everyone in suggested as a $16.60 basis to spot market. If you look at $16.60 on the chart and where we are now, most of those people that took that piece of education that I gave out of where I would enter, are pretty happy right now. Mike Gleason: Yeah. Absolutely. Now, there are some that don't think we're necessarily still in a bull market, so talk about this idea that we're hearing from some of the bearish analysts who say, that the first half of last year where we saw a very strong advance in the metals, as you eluded to, was nothing more than a bear trap, we remain in a longer term down trending market for gold and silver. That was just a blip, what's what they've said. I know you're calling for a strong year for gold and silver, so what is your response to the notion that these rallies are just fool’s gold so to speak? David Morgan: Yeah. Great question and thanks for that. I mean, as you know, I sent this article to you, one of the few, I don't write many articles for the public domain. I usually just do the interviews and post them on our blog and mail them out to our e-mail list. And I went on and said in that article that we are in a situation where I do believe with everything I learned and know, that we are not in a bear trap, as you've talked about. We are in a new bull market, and I'm putting pretty much my reputation on the line. And I eluded to these others people that say what you just said, "That there's going to be a new low ahead." I don't see it. There's a few reasons. One of them is, that silver is leading gold. That's one reason. Another reason is the volumes were vast last year. I'm not talking about 2017. I'm talking about all of the year 2016. Another thing is where was it on a year-over-year basis? The leading group of stocks that was the best year-over-year for 2016 were the mining sector. In other words, from January 1st 2016 to December 31st, 2016, the number one performing sector was the mining stocks. And that was almost round trip because we went up, up, up, up, through the summer. I sold right at the top for the trading part of the portfolio and then we went down, down, down, down, down into the end of the year. And even with it coming down, it was the best performing asset. So, I really don't see it going lower. And these guys that are right ... I made fun of myself for this article. I said, "If I'm wrong throw it up on your favorite Twitter feed." I don't care. I mean, a lot of this stuff is probability. I was asked to give the forecast for what will the silver price be in 2017. I did this time what the banks do. I took it a little more seriously because I kind of look to be seen as some kind of a joke. What I for my paid people is far more meaningful because I can get a better handle on it. Going a year out is pretty hard. What you do is least squares linear regression. I did a least squares linear regression. It's just a curve fitting math formula you learn like your first year in advanced math. So, it came out $22 is the high band ... like a Bollinger Band… $22 at the high, $16 at the low. And I said, I'm bullish. I'm taking the high. Twenty-two bucks for this year." So, that kind of summarizes that part of it Mike. If I'm wrong I'm going to be ... First of all, take it like a man. Secondly, I will be astonished. If we had that rise in price on week volume and the Drukenmillers and some of these big funds were buying gold hand over fist then I would say, "I'm going to pause and I'm going wait and see. And I'm just going to be neutral." But that's not what we saw. What we saw last year was big money coming in a big way in large volumes. And that’s when the price moved up. Mike Gleason: Let's dig a little bit more into some of the primary catalysts here. What are you watching for in terms of some of the geo-political events and some developments in the global financial markets that could have you re-evaluating your outlook for 2017 and beyond to be even more bullish. Share a bit about those potential catalysts for higher prices. David Morgan: Well, fortunately we have new administration that in my opinion may not take a long term view and is looking more reactionary than forbearing into what the meaning of uncertain legislation or edict is. So, let me rephrase that. We have a lot of problems in the United States and in the world ... had a lot of problems globally. Now, most of them center around the banking system having a debt based monetary system. And that's really what needs to be addressed because we cannot grow our way out of this mess. And trying to do that may be something that gets people excited. It may put more people to work and it may even improve the infrastructure. And I'm not against any of those things. But as far as the core value that's really going to have a meaningful impact on humanity, there really is no such thing right now, because the problem really hasn't been addressed. It's putting the lipstick on the pig. Excuse the over-used metaphor. So, this is the situation. So, what I see is if there is more tension and it looks like there certainly could be between, let’s say China and United States or Mexico and the United States. And we start doing what happened in the ‘30s with Smoot-Hawley, in other words, more protectionism and more, "Me first, you second," and that kind of an attitude it will grow tension wise between nation states. And it will have economic repercussions. Now, we're already seeing a contraction in the overall economy so I am a bit ... more than a bit. I am concerned how this will unravel. It's going to unravel one way or another. That is inevitable. That's a mathematical certainty. The problem is you want it to unravel where you can stay ahead of the flood. In other words, there's another metaphor, if the water starts rising in the river, you're going to pack up the kids and the wife and the essentials. Get the car and get away from it. But if that flood is a flash flood, you're going to look out your window and all of the sudden the river is two feet in your house and there is nothing you can do about it. That is a metaphor for what I see potentially happening. And that's not a good place to be because then you're going to get over reaction on the other direction, which means you might get into further currency wars. You're going to have a hard time ... Once the flood is taken over, the flash flood, it's impossible to make it go away and, again, maybe that is a corny metaphor but I mean it. I really want people to picture this in their heads because, Mike, I am more concerned that we are moving too fast in an ever-changing world that could have repercussions that we look back on and say, "Oh my goodness. We should have waited before we did that." Mike Gleason: Yeah. That's a good answer and I echo those concerns as well. It does seem like a very tenuous situation and who knows what it's going to take to get to that tipping point. Expanding on the point here a little bit ... the market for physical metal is transitioned a bit with the election of Donald Trump. Many of our customers are more optimistic today than they were under President Obama, which is certainly understandable. But that does not mean that precious metals will not do well. Especially with rising debts and increasing global tensions and a Trump administration that has been saying they want the dollar to weaken. So, what are your thoughts on the need or lack thereof for physical bullion given the new administration. David Morgan: Well, it's so interesting that it's being objective and it's something I strive to do. I certainly cannot do in the precious metals market. I'm just way to involved in it. But, if you look at people that can be objective you can look at Evan and Associates, who did a study years ago, on portfolio balance. There's a Harvard study and there is a recent one done by CPM Group. And all three of those studies come to the exact same conclusion that regardless of economic condition, regardless of what's going on in the debt markets or the equity markets, having precious metals in your portfolio will give you better overall performance. Wow. What a concept. So, that means if you're super bullish, everything's wonderful, and nothing’s wrong with the world, you should have some precious metals in your portfolio. If you are on the other extreme and think we might go another week before the whole thing collapses, you should have some precious metals in your portfolio. So, it's basically something that is meaningful to get you the best performance under all economic conditions and yet most people are never taught this at all. The reason being is that Wall Street really doesn't make much money in the gold and silver markets. They make their money in the equity and the bond markets. But, they'll come around and probably more on the equity side, which means you'll see more of the resource stocks. Something that we spend a great deal of time doing in The Morgan Report. But, the studies that I'm mentioning is not resource stocks. It is not gold companies. It is physical metals. That's what they're talking about. Mike Gleason: Leads me right into my next question talking about mining stocks. You've been spending a lot of time with mining company executives lately, both one on one at their mines and also at investment conferences. What's the outlook in the miners at this point? David Morgan: Considerably bullish. I mean most of them are convinced, like me, that the worst is behind us and we are going up, but not rapidly. A lot of the people that were marginal in the business, meaning they had projects that were profitable at $25 silvers are gone. People that were profitable at $1,650 gold, they're gone. So, the markets consolidated, which is actually healthy in some respects. And projects are getting funded. There is more cash available for projects to be furthered. And again, mildly bullish. I think that all these companies have gotten leaner and meaner. They've all pretty much cut their margins to, for all practical purposes as much as possible. And, they are optimistic but it's not like the early days at the beginning of the bull market. When you go back to the 2003, 4's, and 5's ... I mean there was like a buzz when you walked into an investment conference, be it a retail conference or an investment conference of professionals, it was humming. It was buzzing. Everyone just sort of knew that the bull market had started in a significant way. It's not that kind of feel at all. It's a feel like, okay, the best of the best have remained. There's good deals out there. Let's seek them out. Let's use our money wisely. And there is a few like me that are thinking two to three years from now ... or maybe a year from now, I don't know. I'm actually thinking more sooner than later. The buzz is going to get back to the early days of this bull market because, unfortunately, these debt problems can't be solved so it will be a lot of money drawn into this sector over the next few years. Mike Gleason: Talking about when we were fully in that bull market just a few years ago, another thing I was reading recently involved a prediction you made back in 2011. You made the case that when silver reached $30 an ounce the public would buy more silver above that level than they would below it and you think that's going to happen again one day. Talk about why you think that will be the case. It's an important point because many would guess that the public would be selling silver if the price got to that level, not buying. Give us your thoughts there. David Morgan: Yeah. Well, when it happened the first time there was a lot of buying about $30. And if you look at a chart, silver stayed above $30 for about a year. In fact if the silver was able to stay above $30 from then on you would have great margins for the better silver companies like some that are on the New York Stock Exchange and on the NASDAQ. I'm not talking about those speculative types of companies. And they don't have great margins to be able to expand. And you have a really good situation. Unfortunately, that's not what happened. So, when we get back to $30 there will be some amount of people who bought it at $30 that will say, "Oh, I hate silver. It's finally back. I'm selling my silver." So, you'll get calls from some of your people that will say, "Mike, I want to sell back my, whatever it is, silver." And of course you make a two way market and that will take place. But, you'll also have a lot of new buyers. And, the reason being is once it gets over the $25, $26 level ... and I'm just using that as a guess. I think it's a good guess ... The psychology in the market will change. And a lot of people that had given up on silver will become some of its biggest advocates again. And you'll get a lot of free publicity all throughout the internet about why silver is the greatest and best, about why it's going to outperform gold, why it's affordable and all the arguments that we've gone over and beat to death. They'll come out from new mouths and they'll go onto new websites. They'll be in new places on Facebook and all the sudden the silver story will explode into new niches that it's never been exposed to before. So, they'll be many new buyers for every seller that just wants to break even at $30 silver that will overwhelm the market. Now that pre-supposes that they'll be enough going on economically that buzz will be taking place. But that's how markets move so I'm nearly certain that's what we'll see. So, you'll see this overwhelming thing and then the people that sold at $30 they’ll say “oh, its hit resistance.” It could take two weeks. It could take two months. It's not going to take two years. It'll take some amount of time to work through that level and then maybe the next one up. There'll be some that bought it at $40 ... "Oh man, if it hits $40 I’ve got to get rid of this stuff." And then once it's in a new high, once it gets to $40 and above everybody will buy it ... I shouldn't say everybody. Many people will buy it at that new high because it's like, "Wow. I'm going to miss it. It's too late, silver’s going to go to $100. Look at the ratio." They'll know all the arguments from these new niches, these new places where they're getting the silver story for the first time and they will believe that they can't lose. And then they'll jump in the market. Silver is such a tiny, little, bitty market any new buying will drive the price higher and higher and higher. And people that hold at a profit won't sell because they don't know how high is high. So, we'll see another move like we saw in 2011 where it went from $19 to $26, stalled out for a little while ... and then from $26 to $48. And I made that trade. Everybody that was on my premium service saw me make it and the ones that followed me into it were super happy that I called the top on that. We are going to see that again accept for this time I think we are talking about a move that's even higher than the $50 level. But, again, I will try to remain humbled by the markets. The markets have humbled me many times and that means that it's possible that, one, it might not go higher than that or, two, that it will act differently than I just outlined. But I'm pretty sure it will be close to that. Mike Gleason: You've written a book advising people on the types of things that they can do when we get to that point so as we start to wrap up here, David, talk about some of the things that you're working on there at The Morgan Report and then, also about that recent book that you and David Smith just released titled, Second Chance: How to Make and Keep Big Money During the Coming Gold and Silver Shock Wave. And then anything else you think people ought to be considering as we move throughout the year. David Morgan: Well, I'll start on the book. One thing that's really disheartening to me is many retail investors. They'll do what's called a round trip. They'll buy a stock. Great gold company. Great silver company and a few other lithium and cobalt and some of the stuff that we do in the report. And they'll go up and up and up and they're happy and tell all their friends and then they just hold it and watch it come all the way back down to where they bought it. That is not what you do as an investor. And so the book, Second Chance is all about different techniques and how to overcome the tendency that some people have to not take a profit. So, we have several techniques like scaling out and whatever. And of course you know my biggest and hardest job will be to call top again. I've been very good at it so far. I don't want to say that too often. I don't believe in jinxing myself or whatever. But calling it exact top is an amateur's game. Think you can do that again and again and again, no way. No one can. I've been lucky ... I'll use the word luck that I have done it every time. And mostly it comes from running in this business because when we get a plethora of new subscribers that's way beyond what we get in an average day or week, that tells me, "Uh oh. Darn it. We're getting to the top." And that was one of the factors that I used in calling the top the last time. As far as what's going on in The Morgan Report... this is something that was said to me 25 years ago, and I actually didn't like it when I heard it, but it's true. One of these gold miners is talking at the Society of Mining Engineers, the S.M.E. Small group and all these guys were pretty rough characters. Nice people but you know, hard workers. And one old guy came up to me and he said, "Man, I've made so much more money in the paper silver market than I've ever made in silver." And I thought, "I don't like that really." But you know what? He's right. I mean you get so much leverage in the mining shares. I'm not talking about futures and options or ETFs, which certainly can make a lot more there on the moves up and down. But the mining sector, some of these stocks just do phenomenally well. In fact, I was going to write an article for the public domain talking about, "Did you catch the move to $50 silver in 2016?" I'd probably got some eye balls on it, Mike, they'd go, "What the hell is Mike talking about now?" And what I'm talking about is one of our top tier picks ... first of all, we picked out in 2016 in the January issue. Our best stocks for the year. And guess what? We hit the nail on the head with all of them accept one. Our performance was like 215%. That's not even close to the IBD percentage that I outlined earlier in the interview. There's is I think 56, which I'm doing from memory. You can check my facts. It's the idea that's more important than the exact number. But we were beating the IBD. index by a huge factor like 2, 3, 400%. It started at off $14 low in early December 2015, and then the stocks bottomed over the 19th of January, 2016. And then we were off to the races for a while. So, I think a balance is what's important. You know people say, "You push this and you push that." Well, I push balance. If you don't have metals, real physical metals that you can get at Money Metals Exchange ... Get a good dealer. One you can trust. One that delivers what they say there are going to. One that stands behind their products. One that makes a two way market. One that helps educate their clients. Everything you do at a Money Metals Exchange Mike. You and Stefan have been good friends of mine. Never had anyone come back to me and say… I mean, everyone's come back and said, "I'm glad I sent you there." And I spread it around, you know that because I know most of the major dealers on the wholesale and the retail side. But you know, you do it right. My point is that if you don't have physical precious metals, I don't want your business. If you do and you want to go to the next level of making money where you can do more in the paper markets than you can in the physical markets but, you own physical, which is the most important part, then certainly look at The Morgan Report. And I give them a free chance. In other words, you can get on a free list and with our free list we write every weekend something that either I compose or it comes out on The Morgan Report. We try to make it beneficial to everyone that reads our work. And it is not The Morgan Report. Membership has its privileges. Membership means you are a membership part of the website, which is a protected, password enabled portion that has vast amounts of information. Not only the monthly Morgan Report, but the videos I do on an as required basis talking about the commitment of traders, how the markets are set up, why the bond market is about to fall off, why the bond market has peaked, why we're in a distribution pattern in the stock market, why the market ended up now to make everybody feel good, what it's going to look like further out and on and on it goes. So, and the other thing that I felt was very important because I try to put myself in the buyer's shoes ... You know what I really want in a newsletter ... and I've seen them all. I was a newsletter junky in my twenties and early thirties and I've seen most of these guys and what they've produced. I just didn't want to do that. I wanted to give a whole different fresh outlook on the sector. Well, when I write a question to them I want them to answer so we guarantee that we will answer all of our paid members, whatever question write. Now, they’re limited to two a month, which is pretty generous really. And they can ask us darn near anything. But a lot of times it’s on something that we’ve covered in The Morgan Report, and then we put that question to Letters to the Editor and we answer it for everybody's benefit. And on it goes. So, it's one part of being a member of The Morgan Report that I would want. I would want the person I was paying to be responsible to me and if I had a question I certainly would want to get an answer. Mike Gleason: Well, it's fantastic stuff for sure and I can say with great confidence that if you are going to invest in mining stocks, don't do it alone. You need to take the advice of a trusted analyst like David Morgan and the team he has there. It's very worthwhile if that's a market that you're going to play in. Obviously, get the physical first. We both agree on that. But David and his team can certainly help you navigate those waters in the mining stocks because it's not easy to do on your own if you don't really know what you're doing. Well, David, great stuff as usual. We always appreciate hearing your thoughtful analyzes and your level-headed approach to these markets. Thanks so much for taking the time and for providing the service that you do there. We certainly wish you all the best and look forward to catching up with you again very soon. David Morgan: Well, thank you Mike. Appreciate it. Mike Gleason: That will do it for this week. Thanks again to David Morgan, publisher of The Morgan Report. To follow David just visit TheMorganReport.com. We urge everyone at the very least to go ahead and sign up for the free e-mail list and start getting some of his commentary on a regular basis. And if you haven't already, check out The Silver Manifesto and now his new book as well titled Second Chance: How to Make and Keep Big Money During the Coming Gold Silver Shock Wave. Both of which are available on the Money Metals website and other places where books are sold. Be sure to check those out.